Fargo City Hall is located at 209 3rd Street North, Fargo, ND 58102; phone: 701-241-1310. 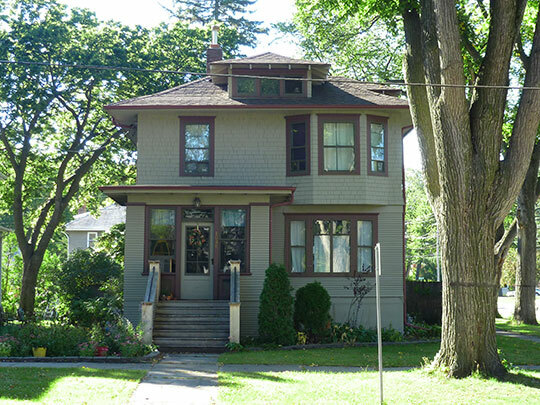 Photo: Home in the North Side Fargo High Style Residential Historic District, Fargo, ND. The Historic District was listed on the National Register of Historic Places in 1987. Photographed by User:Cent2Fargo (own work), 2014, [cc-by-3.0 (creativecommons.org/licenses/by/3.0)], via Wikimedia Commons, accessed August, 2015. Originally named Centralia, the city's name was changed to honor William Fargo, founder of Well Fargo and directory of the Northern Pacific Railway. Fargo, the seat of Cass County, is located in eastern North Dakota adjacent to the Minnesota border and the Minnesota city of Moorhead. Fargo is about 190 miles east of Bismarck, the state capital. The city is situated on the west bank of the Red River of the North, which originates south of Fargo and flows north into Canada. The Red River bisects a flat valley formed by a massive Ice Age body of water, Lake Aggasiz. Covered with rich soil, the Red River Valley is now an agricultural region planted predominantly in wheat. Three major historic railways converge on Fargo: the Great Northern and the Northern Pacific (both now part of the Burlington Northern), and the Milwaukee Road. These railroads, more than any other factor, define the spacial arrangement of the city. At Fargo the Great Northern tracks run basically southeast-northwest, the Northern Pacific tracks east-west, while the Milwaukee Road approaches from the southwest. In the middle of Fargo the railroads are all located within several blocks of each other. The most intensely developed areas of Fargo the business and industrial districts surround the downtown railroad tracks. Fargo's residential neighborhoods lie to the north and south of this central railroad, business, and industrial core. Moorhead, Fargo's Minnesota counterpart, is located immediately to the east, on the opposite (east) bank of the Red River. Fargo, like most large cities in the American West, originated before 1890, the date at which the western frontier is said to have closed. Farmers and ranchers began to settle the semi-arid but fertile Great Plains prior to 1890, and railroads constructed transcontinental routes across the region, attracting settlers and creating cities in their paths. Major growth of Great Plains agriculture and cities, however, did not occur until the industrialized economy of the United States embraced the region. During the late 1860s, the first pioneer land speculators and agriculturalists arrived in the Red River Valley in the vicinity of the area that is now Fargo. In 1871, the Lake Superior and Puget Sound Land Company, a firm related to the Northern Pacific Railroad, platted the Fargo Original Townsite. Soon after, the Northern Pacific built its line through the townsite and urban, pioneers took up residence there. A number of people then claimed the land surrounding the settlement. By 1873, Fargo's population stood at three hundred. Following its congressional mandate, the Northern Pacific continued to build its line west out onto the Great Plains, but the Panic of 1873 and the corresponding financial collapse of the railroad halted construction at Bismarck. Without steady railroad activity to sustain it, Fargo languished for several years. During the late 1870s and throughout the decade of the 1880s, the first of North Dakota's two major agricultural booms revived the city. The Great Dakota Boom, as it was called, resulted from a combination of events related to the rapid industrialization of the United States. Improvements in flour milling and growing eastern and midwestern cities created a greatly expanded market for wheat. Railroad penetration into the flat, treeless, fertile Red River Valley and the availability of agricultural machinery that could cultivate vast acreages created opportunities for farming on an unprecedented scale. Wealthy capitalists soon acquired vast holdings of Red River Valley land, which they planted in wheat. These "Bonanza Farms" ranged in size from ten to sixty thousand acres. At each farm, hundreds of workers used new types of machinery to plow, plant, reap, and thresh the wheat. Wet weather contributed to spectacular yields that made Bonanza Farm owners rich. Smaller farmers also benefitted from the favorable economic and climatic conditions. With the advent of the Great Dakota Boom and bonanza farming, Red River Valley cities flourished. Fargo became an important regional commercial center. By 1881, seventy railroad cars of wheat per day passed through the city on the way to eastern mills. As early as 1879, several farm implement manufacturers, including the Massey and McCormick companies, opened branch distributorships in Fargo. The first grain elevator in North Dakota was built in Fargo during the Great Dakota Boom. The Fargo Foundry, an early manufacturing business, grew because of contracts with the Northern Pacific. Two additional railroads began to serve the city during the early 1880s: the St. Paul, Minneapolis and Manitoba (later the Great Northern) and a small short-line, the Fargo Southern. Economic activity stimulated population growth, so that by 1885 Fargo reportedly had over seven thousand inhabitants. By the late 1880s, speculative excitement which had fueled economic expansion subsided and drought set in. The Great Dakota Boom came to an end. New settlement in Dakota Territory lagged. In Fargo, the population fell to a low of 5,664 in 1890 and the city again entered a period of stagnancy. The nationwide Panic of 1893 further stifled economic activity. The same year an intense conflagration, the Great Fargo Fire, consumed much of the city. However, the fire stimulated a renaissance as Fargo's inhabitants began to rebuild. Mark T. Fiege, Historian, Jack Crowley, Field Technician and Fredric L. Quivirk, Architectural Historian, Renewable Technologies, Inc. for the Fargo Heritage Society, , nomination document, 1986, National Park Service, National Register of Historic Places, Washington, D.C.